As the temps drop, it is easy to fall into a workout slump. When it’s cold out, it’s twice as tempting to just stay inside, where it’s cozy and warm. Well, this year, make it different! Here are some winter fitness tips to help you stay motivated and active this winter! If you struggle to workout alone, or don’t really know what to do when you get to a gym, a class is a great option. From kickboxing, to yoga, to Zumba, and so much more, there are nearly endless options of classes you can attend to get your exercise in. Working out in a larger group like that also pushes you to keep going past where you might have gone if you were working out alone. By that 10th push-up, you may have quit when on your own, but in a class, everyone else keeps going, so you feel the need to as well. Plus, you’ll never know what fun new workout you’ll discover, and you’ll never know who you may meet — possibly a new workout buddy. I have met so many of my great friends in my workout classes. 2 // Find a workout buddy to help motivate you and hold you accountable. Because they will hold you accountable to make it to your workouts. Pick someone that you can count on to hold you to your word. If you both commit to a yoga class at 7 a.m., but you wake up at 6 a.m. wanting to cancel, knowing that your workout partner will be there alone serves as motivation to push you to get going. Also, working out with someone alongside you can make it a lot more fun! I also love my apple watch for this- view your friend’s/spouse’s workout and make it fun! 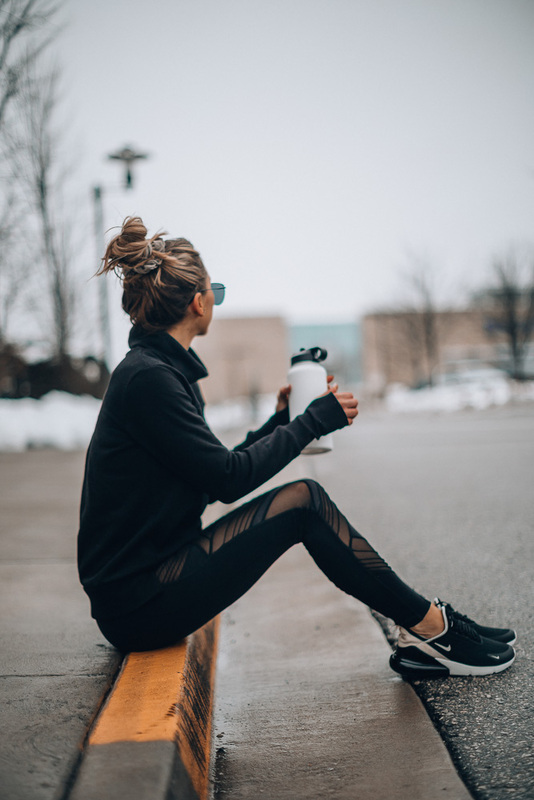 I’ve always felt that a new pair of leggings or a pretty new sports bra gets me out of my rut of not wanting to go to the gym. 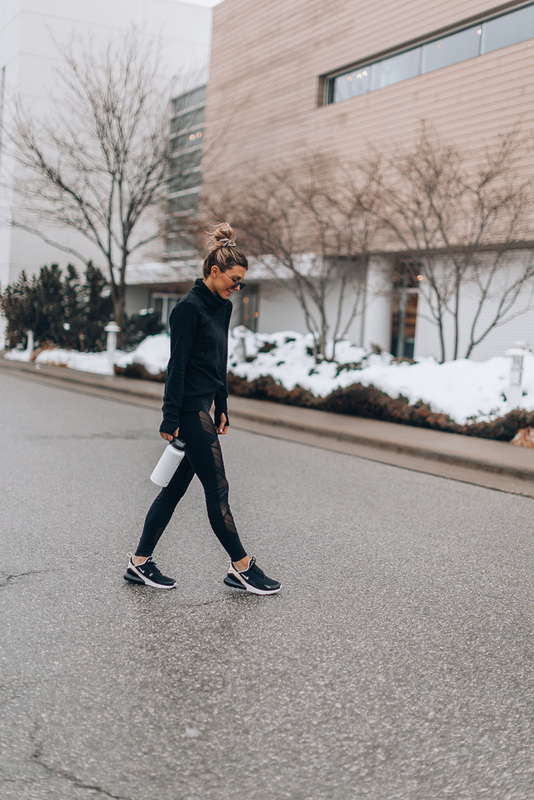 Nordstrom carries all of my favorite activewear lines from Alo, Zella, Nike, Outdoor Voices and more, so it’s my one stop shop for new activewear pieces. I just found these leggings, sneakers, pullover, and my favorite no show socks – all from Nordstrom. People who stay in shape all year long make it a habit, just like brushing your teeth. Exercising just once a week won’t lead to the mental and physical changes you want in your life. I know it’s hard to wake up extra early, or go to the gym straight from work. But really think about how you’re using your time, and figure out how squeeze in workouts three to four times per week. No excuses! You are just one workout away from a better mood! I think about how I feel after every workout and that is what motivates me! Those good endorphines! 5 // Create a playlist! Music is everything when you are working out. Find what genuinely makes you feel something. I find that when I pick songs that my heart resonates to, I’m more likely to actually feel more wrapped up in the music than the physical pain of working out. Have you ever been in a workout rut? How do you get out of it? Let me know!